This funky find came courtesy of Granny Rozell (Shane’s spunky 94 year young grandmother). 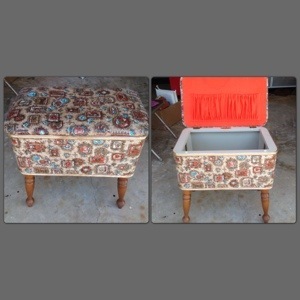 When we helped her move into a nursing home a few years back, I nabbed this sewing bench, which was filled with vintage sewing goodies (mainly because I cannot resist adding more vintage thread spools to my collection!). Although I knew that I would not be using it in its present state (no offense to the groovy 1970’s vinyl) I knew that if I stored it long enough I would find a useful place for it. I laugh at that last statement! Our attic, garage and every out of sight nook and cranny of our house is filled with “don’t throw that away, I promise I will find a place for it and re-do it one day” projects! Sure enough, a year or so later, the light went off in my head. I needed a cool bench/storage something or other to place in our bathroom. Something both functional to store “unsightly” bathroom necessities and an occasional sitting area, while also being visually appealing. 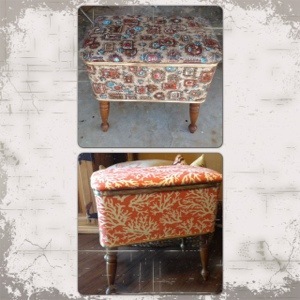 Granny Rozell’s sewing bench would be perfect! Now, to find the perfect fabric to use. 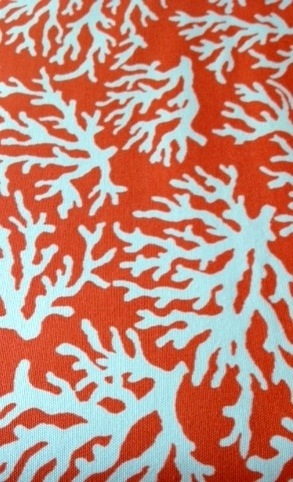 Our bathroom is decorated with accents of natural coral and unique seashells. It is painted a beautiful charcoal gray with dark wood accents. 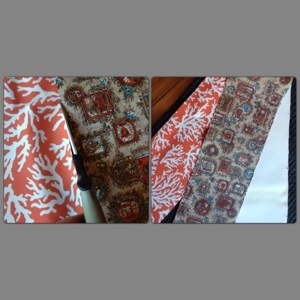 I knew I wanted an orange fabric with white or ivory coral pattern and I wanted it that same day—no time to order it and wait for it to ship. Yea right! Well, the fabric fairies at Jo-Ann’s Fabric and Craft Store was smiling down on me. We walked in, I went straight to the cotton duck section (it is in a bathroom, after all) and viola….there was the exact print I had imagined. Hey….sometimes things just work out! With several tools in hand: a hammer, a screwdriver, a staple gun, a hot glue gun, spray adhesive and some random tools I have no idea what are, we disassembled the entire bench, stripping it down to its cardboard and wood frame shell. I actually liked the gold vinyl trim, so we carefully removed it using a screwdriver to separate the folds and pliers to remove the staples. We also carefully removed the vinyl covering using a staple puller, so we could use it as a template when cutting the new fabric. 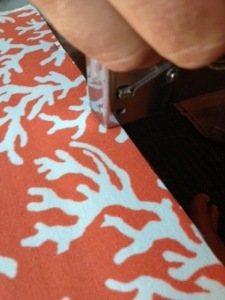 Using the original vinyl we took off as a template, I simply laid it on top of my fabric and cut it out. Oh sure, you could measure the actual bench and lid, make a fancy pattern out of paper, pin it carefully to the fabric and then cut, but Hey….just laying it down and cutting works. 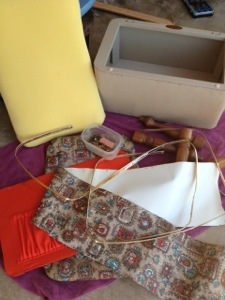 Now it was a matter of lining the fabric up on the cardboard and wood base and using a staple gun to attach the fabric, by pulling tight, staple, repeat. We alternated stapling on the top and then the bottom, to get a snug fit. 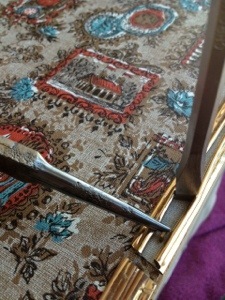 The gold trim I saved from the original piece will cover the staples, but we still stapled close to the edge. When we got to the end, we folded the fabric under and carefully stapled in the fold of the fabric, so the staples would be hidden. 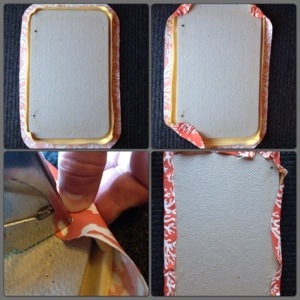 Using spray adhesive, we adhered the original foam padding to the lid, flipped it upside down and centered it onto the back side of the fabric covering and stapled. There are tons of tutorials on how to re-cover furniture, professionally. This probably is not one of them— however, our technique was to staple the corners first, then pulling taunt, we worked our way across the top and bottom as we stapled and then down the sides. Again, we would be covering the interior with a fabric lined cardboard piece, so our staples would not be seen. 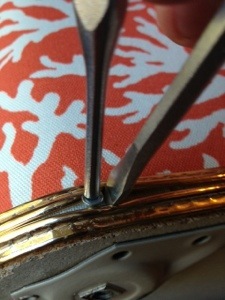 To reattach the gold trim, we used small tack nails. Holding the trim open with a screw driver as we went along the edge, Shane would tack the nails in place with a small hammer. For the interior lining of the lid, I used the same cardboard and re-lined it with a natural cotton fabric I already had on hand. I used the cardboard as a template and cut out the fabric about 1″ larger all the way around and used hot glue to adhere the fabric to the back of the cardboard and attached it to the lids interior with brass upholstery tacks. Using my 2 BFFs, Old English and Murphy Oil Soap, I gave the wood legs a bath and a shine. At first I thought about painting the legs, but because the natural wood matched the decor in the bathroom already, a spit and polish was all they needed. Here is the finished product, after attaching the legs and lid. It fit perfectly into the corner of our bathroom…both functional and stylish….just the way I like it!